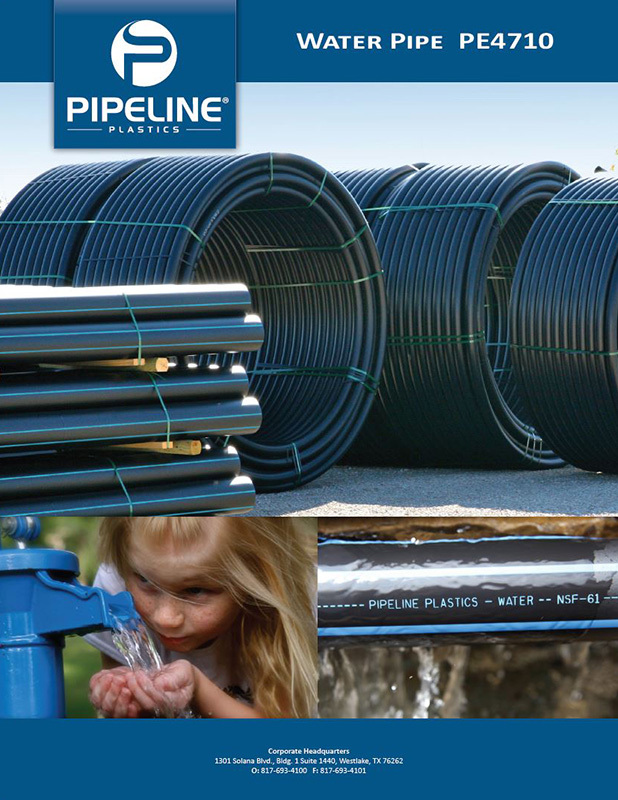 Pipeline Plastics PE4710 Water Pipe is a high performance bimodal, high density polyethylene (HDPE) pipe designed for raw water transmission, potable and municipal water applications, as well as gravity and force sewer mains. Our PE4710 Water Pipe’s heat fused joints provide a leak free, NSF certified, quality water system which is corrosion and seismic resistant to ensure a lifetime of safe and clean water. 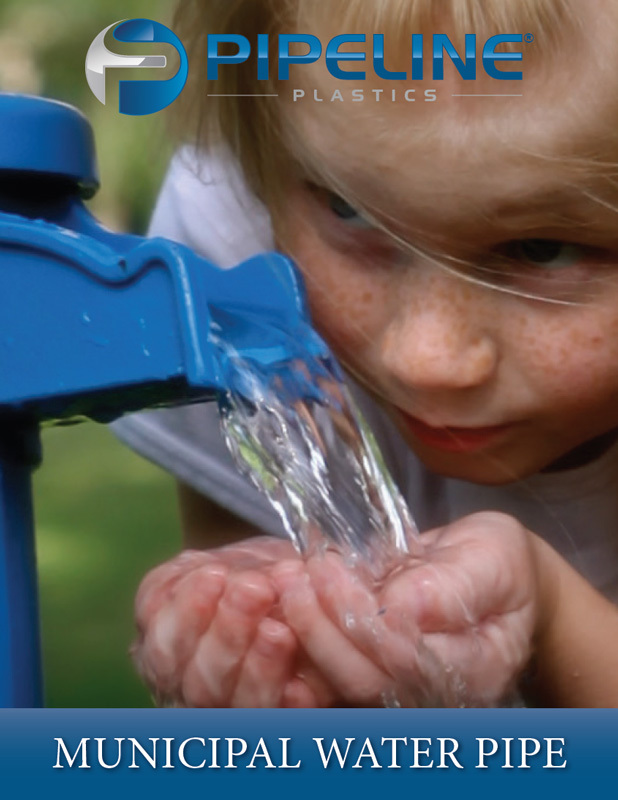 Pipeline Plastics PE4710 Water Pipe is a high performance, bimodal, high density polyethylene (HDPE) pipe designed specifically for potable and municipal water distribution systems. HDPE pipe uses heat fusion for leak free joining, and is cost effective to install both in open cut and trenchless applications. NSF certified, our PE4710 Water Pipe is extremely low maintenance by withstanding pressure cycling and seismic events better than traditional materials to achieve a >100 year design life. 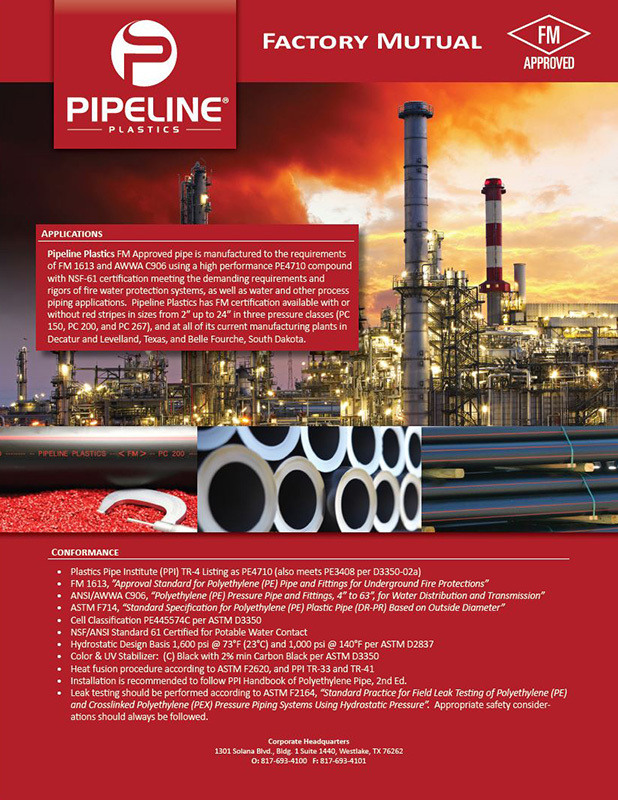 Pipeline Plastics PE4710 Industrial and Mining pipe is a bimodal, extra high molecular weight (EHMW), high density polyethylene (HDPE) pipe designed for Raw Water, Process Water, Waste Water, Chemical and Corrosive Applications, Mining, Dredging, Slurry, Irrigation, and other Industrial Applications. 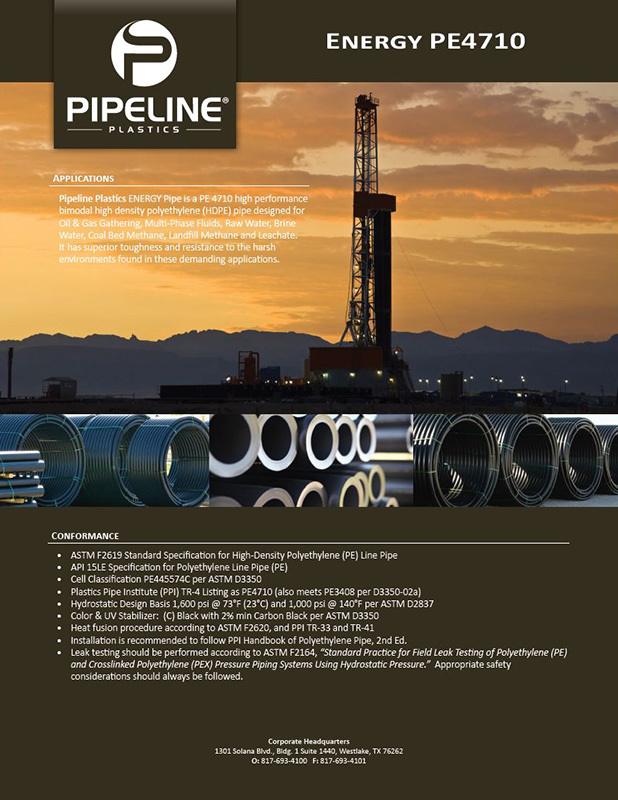 Pipeline Plastics ENERGY Pipe is a PE 4710 high performance bimodal high density polyethylene (HDPE) pipe designed for Oil & Gas Gathering, Multi-Phase Fluids, Raw Water, Brine Water, Coal Bed Methane, Landfill Methane and Leachate. It has superior toughness and resistance to the harsh environments found in these demanding applications. 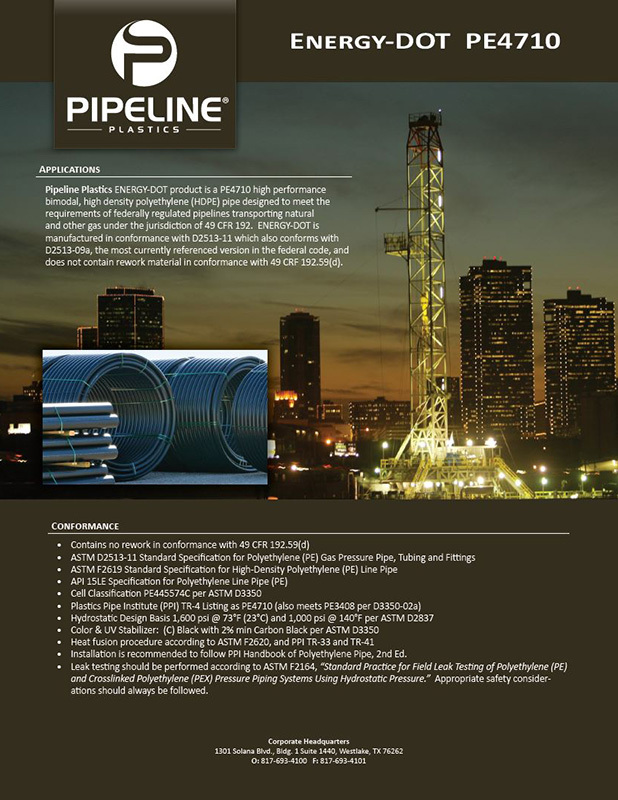 Pipeline Plastics FM Approved pipe is manufactured to the requirements of FM 1613 and AWWA C906 using a high performance PE4710 compound with NSF-61 certification meeting the demanding requirements and rigors of fire water protection systems, as well as water and other process piping applications. Pipeline Plastics has FM certification available with or without red stripes in sizes from 2” up to 24” in three pressure classes (PC 200, PC 250, and PC 335), and at all of its current manufacturing plants in Decatur and Levelland, Texas, and Belle Fourche, South Dakota. 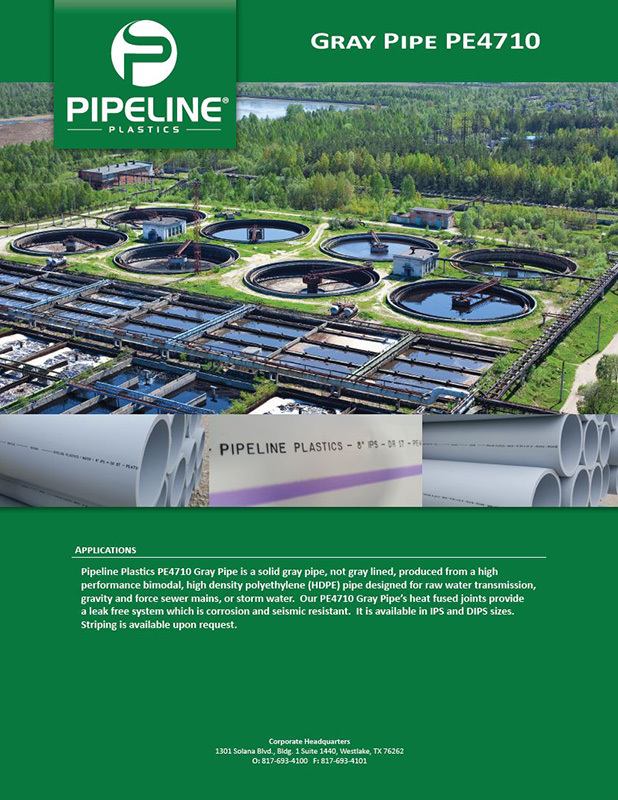 Pipeline Plastics PE4710 Gray Pipe is a solid gray pipe, not gray lined, produced from a high performance bimodal, high density polyethylene (HDPE) pipe designed for raw water transmission, gravity and force sewer mains, or storm water. 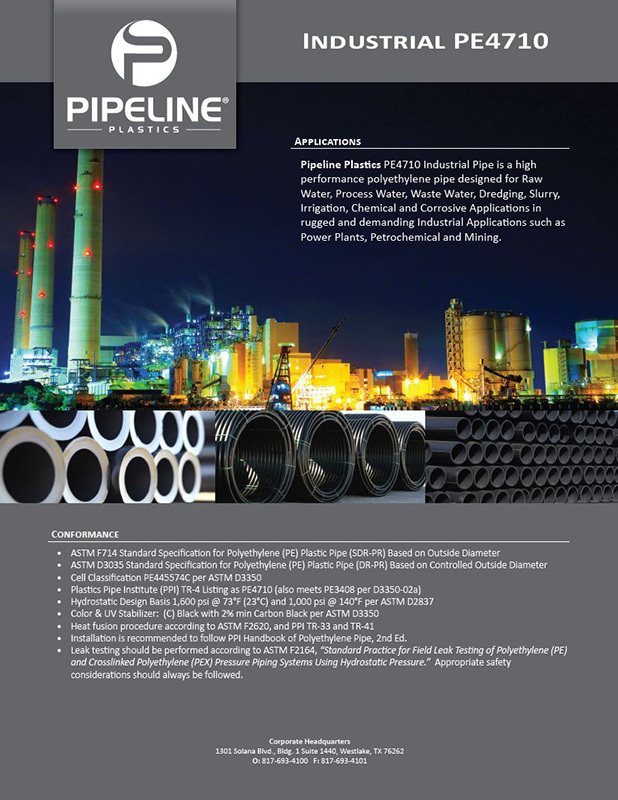 Our PE4710 Gray Pipe’s heat fused joints provide a leak free system which is corrosion and seismic resistant. It is available in IPS and DIPS sizes. Striping is available upon request.